(c) 2019 Oh That's Filthy. All rights reserved. Director of Photography - late bloom. JoeeBilli exudes style and urban artistry as he performs his life anthem "Feel Like This" from the forthcoming album "The Billi Show." The music video adds the visual perspective of an artist that viewers can relate to and be inspired by. JoeeBilli is a humble, creative, talent, that you want to see win, which is special because he wants to see you win. The simple yet infectious hook is key to driving this affirmation of striving for success and believing in yourself. If you actually repeat the hook out loud, it feels good. In a world full of over saturated negative music, you should want to FEEL LIKE THIS. Official "Feel Like This" music video by JoeeBilli. Directed by @qthemusic Shot by @danariceproductions . PCMG Worldwide. All rights reserved. Distributed by CREATE.Digital Music. (c) 2018 PCMG Worldwide. All rights reserved. Inspired by the LIFE, afterLIFE, faith, intelligence, and creativity of Kifani “Doulos” Thompson (3/27/75 – 5/31/16). Eeerrriiittt! That’s how you call ya boy! © 2018 Jesus Plated Music. All rights reserved. The Wake Up Show has enjoyed a legendary sort of notoriety throughout the Hip-Hop world for their classic mixtapes over the last few decades. Sway and Tech are known for breaking some of the illest emcees to ever tough a mic on their show. But instead of stopping there, they took that same energy and put it into presenting those artists in the form of compilation mixtapes for the masses. It’s no secret that emcees around the globe have grown up listening to these mixes and trying to emulate their formulas for dopeness. However, it came to everyone’s surprise to see their protégé Skyyhook releasing a series that seems to be in the same vein as the dynamic duo of whom she has been studying under for the last five years. We spoke to Skyyhook of the The World Famous Wake Up Show to see what what the project is about and how it came to fruition. According to Skyy, “This project is what we’re calling, “a labor of love for the culture.” It was a concept that kind of came about by accident at SXSW this year. I was speaking to Pro from Create Digital Music about being on crutches after a recent surgery and the subject of me needing something else to occupy my time sort of came up through that conversation. I never thought in a million years this would be the project! (laughter) But here we are! I was approached about doing something Wake Up Show related and I immediately went to King Tech for his thoughts on the matter. He said he was in my corner and it was time for me to show the people what I can do. So, I rocked with the idea! Having the blessing of both him and Sway makes this project feel legit. I know they wouldn’t ok it and pass me the torch if they didn’t think I could do it! And that’s an amazing thing. Truly. So, I took to the roster of artists that I’ve broken over the last five years on the show and just sort of curated voices at first. I wanted to make sure they sounded right together. They absolutely complement one another in the way they flow and what they’re talking about. It was hard though because I like all of the artists that I’ve broken! Their work excites me in different ways. But I think this was the right grouping for the first Volume in the series. They just make sense together. 5. If your music could impact one social issue today, what would that be? 2. While your are writing a song or in production sessions, does the audio engineer in you ever clash with the creator in you? They work together harmoniously hand in hand. I do spend a lot of time on the mix because I want it to sound perfect! 3. What's your affiliation with Music Works NYC and Music Works Records? I am a business partner and Chief engineer at Music Works Studios, Co-founder of Music Works Productions and an artist on Music Works Records. 4. Who are some of your musical influences and why? Michael Jackson I love how he brought so many different people together with his music …. Brandy's voice, harmonies, harmonies, harmonies and her positioning as an artist. Neyo’s music touched my heart and made see colors for the first time while listening. 5. Elaborate on the concept of your song "It's Like Everytime." ARTIST | SONGWRITER | PRODUCER "JOEEBILLI"
QUESTION: What is the origin of your name JoeeBilli? ANSWER: The origin of my name is Josh Over Everything (JOEE) my gov name is Josh and one day I want to be a billionaire. QUESTION: You have worked with incredible artists like Casey Veggies, Tank, Nipsey Hussle, K Camp, Charlie Bereal, Lonny Bereal, and Skeme. Who is on your top 3 wish list to work with in the future? ANSWER: My top 3 would have to be Post Malone because everything he does goes platinum, I want Tank to let me produce a whole album, Then I would have to say Drake. I could retire with this line up lol. QUESTION: What would you say is your best creative attribute? Production, songwriting, melody, or concept? ANSWER: I've been blessed to be around amazing singers and creatives in their process of recording and writing songs from scratch, So I would say for me, creating melodies from scratch. I also pretty much produce myself and create the music, so that's a strong attribute as well. QUESTION: How did you become a CREATE.Digital Music client? And what convinced you that they were key in your next phase of creative content? ANSWER: I became apart of the CREATE.Digital Music family thanks to my long term mentor and manager Kenny Bereal. I knew it was the move for my content, when I talked to Pro on the phone, he had told me he checked me out online and liked what he saw, I think that was it for me, the fact that he checked me out and wasn't just talking about business. At any point I need guidance CREATE.Digital Music's team is fast and very helpful. QUESTION: Name one problem that bothers you about the current state of music and what your solution contribution to the solution is. ANSWER: I don't have a problem with the state of music right now, it can be over saturated but in the end at this time now, if you have dope music you can break! Literally overnight that's magic. That's what I'm hoping to do myself. Amilcar "PRO" Welton (@createdigmanpub) Founder of CREATE.Digital Music and Creative Director for "Unprecedented"
In this human experience, we all have a certain vulnerability and balance of strength that walks the thin line between a deep negative spiral or a positive evolutionary rise when met with life's challenges. 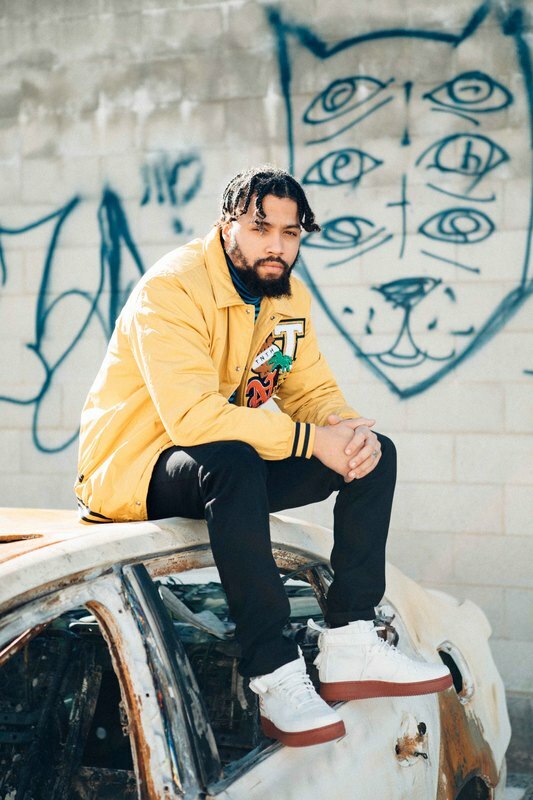 The CharlesInCharge (@cinchargemusic) single and visual "Unprecedented" translate that mental and emotional state accurately from the male perspective, although all genders can relate. In some cases, even before you ever clearly express your thoughts and feelings to the individual(s) involved, you unwillingly have a conversation with yourself. This is one of the most difficult tasks when attempting to heal a situation. Knowing that others have these same experiences and survive the growth is a powerful, yet subtle, message to translate musically. For the album series, "Unprecedented," was appropriately selected by CharlesInCharge as the opening song of the first installment. For me, the vibe eases you into an open mindset, explores multiple emotions, and introduces you to the musical abilities of CharlesInCharge and his collaborators. Amilcar "PRO" Welton (@createdigmanpub) Founder of CREATE.Digital Music and Director for "King's Ransom"
One of the most difficult tasks in this business, as creative executive, is to assist a creator in delivering their message that is based heavily on their own life, to a mass audience. As an artist, producer, songwriter, and executive, CharlesInCharge (@cinchargemusic) is creative, detailed, and intentional in the execution of his vision. That being said, being designated as the creative director (a.k.a. A&R) for the song "King's Ransom" and the director of the visual experience, I had to equal or surpass his passion and vision for the message. You can image how stressful, sensitive, humbling, and honorable this task was. My advantage was that I was present to watch him birth this powerful idea and begin to formulate what it's existence would be. My approach from day 0 was to allow the organics of the creative process musically and visually to grow without obstacles, but enhance it with intentional creative and business purpose. Without the professionalism, belief, and creativity of our collaborators, this important content would have fallen into the file with the thousands of poorly executed songs and videos who's messages were meant to touch the core of human emotional evolution. The conversations that this content generates, while still entertaining, will help it exist in relevance for an extended time period, for CharlesInCharge, his family, fans, our impacted communities, and for Hip-Hop culture. What started as an open letter to his children will end as a legacy. ​Thank you for taking the time to sit down and talk to with me and our audience Craig. I really appreciate it. How about you tell everyone where you're from originally? Craig: No problem, I'm from Philly, South Philadelphia, Tasker projects specifically. It’s a real rough place, pretty dangerous. I was born and raised out there till about 17 when I moved out but I still hung out there. Did growing up in Tasker have a major influence on your music? Craig: Yeah, Definitely. You see it more in my unreleased music but a lot of my stories are true. The subject matter that I talk on are all Glances at experiences I have literally seen or was there when it happened. It was my everyday reality. To a person who didn’t grow up in that type of environment it may seem abnormal or crazy but to someone who has been immersed in it, it’s just the norm. How do you think growing up in that environment affected your overall life? Craig: I’m not mad I grew up there because it helped shape me in positive ways as well. I feel like I have a good balance opposed to someone who is sheltered or their only knowledge has been sucked out from a book. As where I have a blend of street smart and actual intellectual properties that you need every day too. I feel I’m a fair medium of both. Who would you say your biggest musical Influences are? Craig: Number one is definitely God. G-O-D... but I really listen to everything. I can’t say one particular person influenced me most because I feel I’ve taken bits and pieces from everyone. If I had to pick one artist I would Kanye and Big Sean, mainly because people have told me that I sound like them the most. I would also throw in Part Next Door. I want to talk about your newest single “Trampolines." What is the theme of the song? Craig: I just wanted to have fun. A lot of my music touches on politics, social issues or something deep so I wanted to get away from that. It just kind of happened to be honest. I already had my verses written out and on my way to the studio and I was just freestyling the hook and out of nowhere “Trampoline” kept popping in my head over and over. As I was working on the hook the “Flyer than a 747, doing 120 in a 745” came in my head and then I really liked the number scheme so I continued with the “32 shots loaded in this mac11” and was like boom there’s the hook. I am looking at your cover Art for “Trampolines” is that a giraffe? Who or what is that? Craig: Yeah ha ha that’s my Mascot. My nickname on stage is “Mr. Superb”, I go by my government, Craig Myers, but that’s my nickname. So the giraffe is called “Little Superb” because he’s derived from me. How did that concept come about? Craig: The image of the mascot came from a picture of me at one of my shows from a while back. Literally I was wearing the same thing, I had on some nerdy Gucci glasses, a cardigan, a bow tie, some hi top Barkley's, skinny jeans like that’s me! Ha Ha. Craig: It came from from me wanting to embrace my uniqueness, individuality and just being different so I wanted to claim and own that. I can't fit in because I’m always going to stand out. Just like if you try to put a giraffe anywhere and try to hide it, it’s always gone stand out, its not going to fit in, it’s always going to stand out. In this music game you want to stand out, you don't want to blend in with everyone else. What's the next step or project for Craig Myers? Craig: I’m going to release another single called “Holy Matrimony” The best way to describe it is like a Trap wedding song. I’m steadily trying to put out singles though. I plan to release an additional five to seven songs before the year-ends and just carry that energy and consistency into 2018.